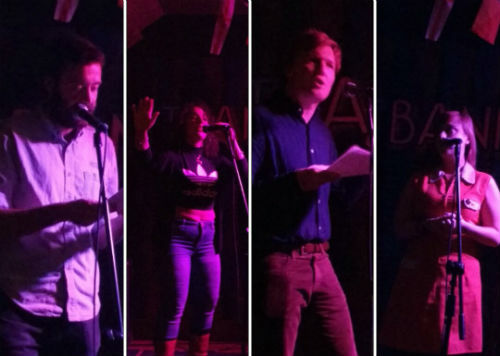 A warm, friendly story-telling night, showcasing the talent of Bristol and beyond. 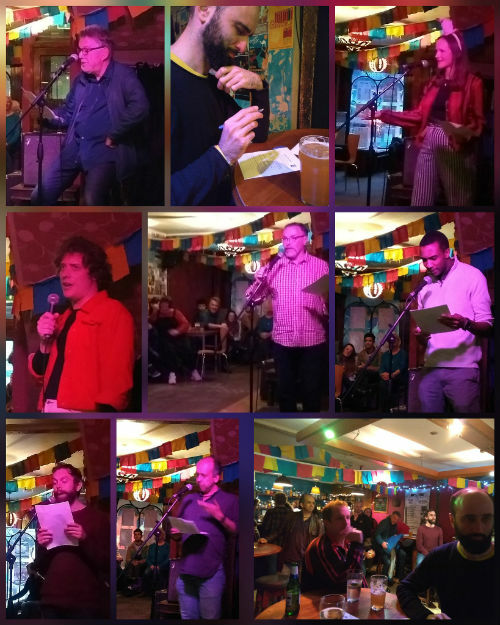 The next Talking Tales will take place on Tuesday 11th June 2019. Join us for stories, beer, badges and the legendary 'Finish the Lines'. When? Date Tuesday 11th June 2019. Where? 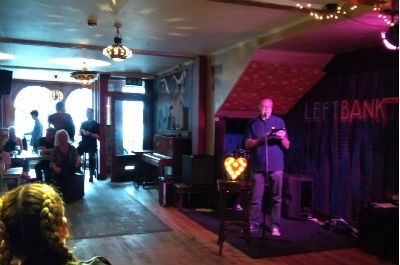 LeftBank, 128 Cheltenham Rd, Bristol, BS6 5RW. Start time? Doors open 6.30pm. Deadline for submissions? Friday 31st May 2019. How do I submit? Please read the submission guidelines below. 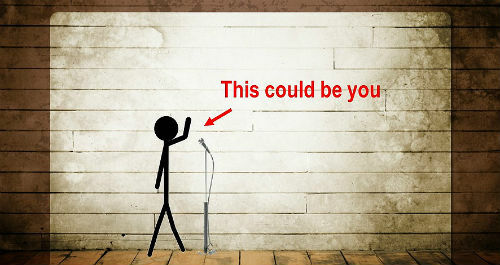 We want YOU to perform your story. Our submission guidelines are super-simple, much like us. Newcomers welcome! There isn't usually a theme, but if there is, it will say so below. 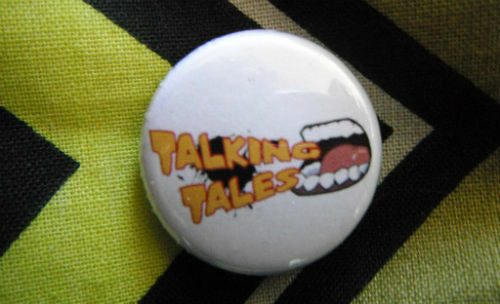 All readers are awarded a coveted Talking Tales Badge. Over enthusiasm regarding potential badge ownership when submitting will not be tolerated. Please attempt to contain your excitement. We know it's difficult, but try. 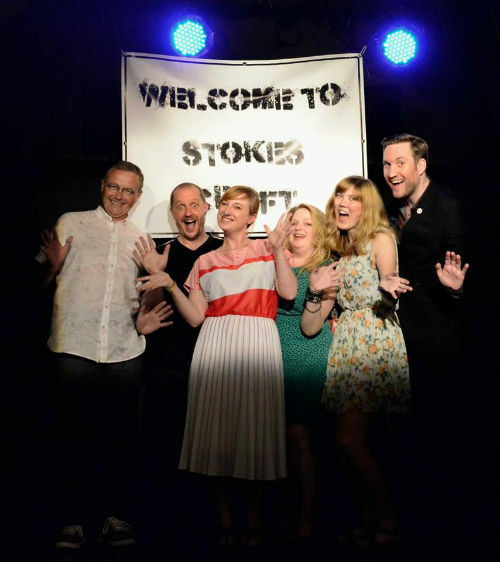 Talking Tales has been running for many years and we've enjoyed many a multitude of performances from writers in the local area and further afield. We record many of the events and release a podcasts or videos on YouTube afterwards. 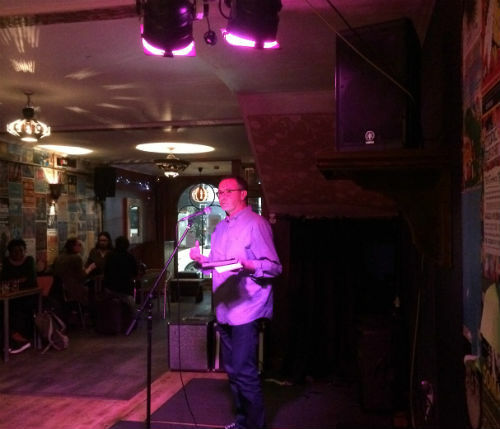 Stokes Croft Writers (SCW) is a fiction writing group based in Bristol. 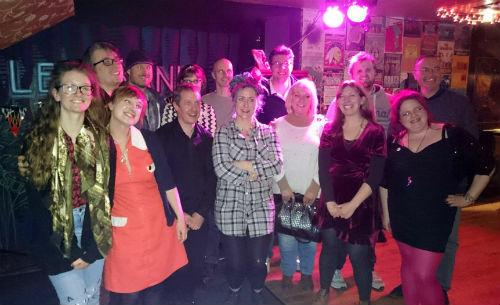 We meet up every 2 weeks to share and critique our short stories, novel chapters, non-fiction pieces and anything else written by members of the group. 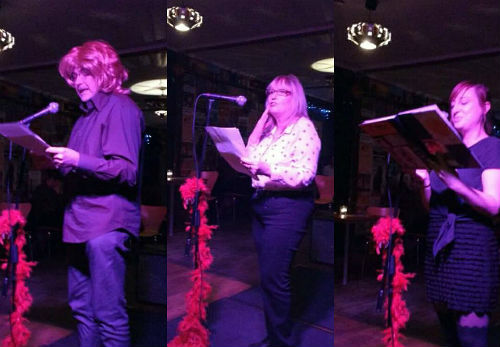 We are an eclectic bunch, writing everything from humour to fantasy and flash fiction to novellas & novels. 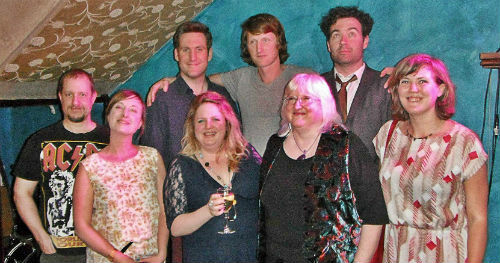 Many of the group members help judge the To Hull & Back humorous short story competition. 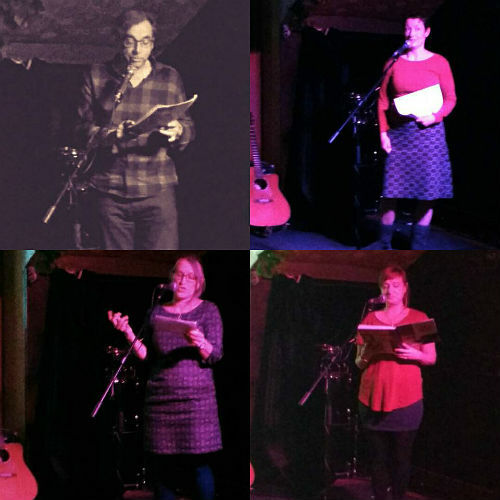 You can read their stories in the anthologies. 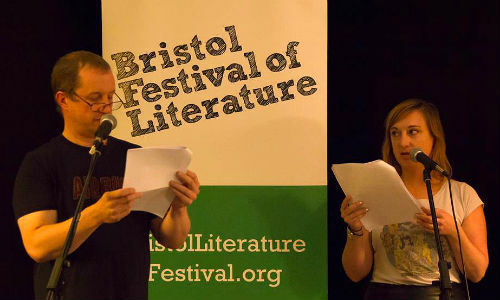 SCW is also involved with the Bristol Festival of Literature and we often present The Speakeasy, which is the festival's closing event. 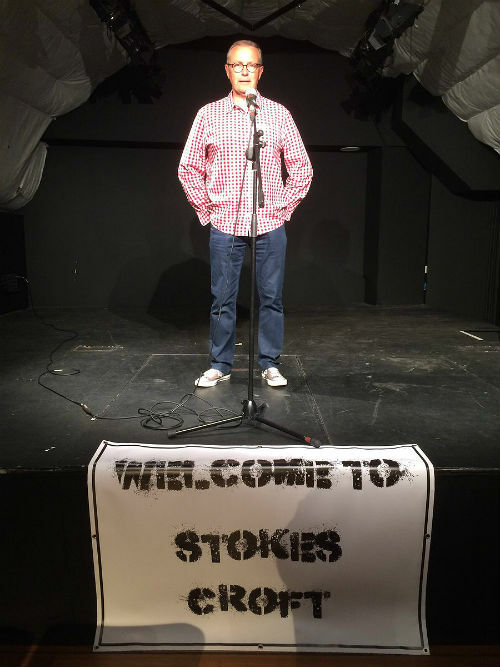 We used to have a website (www.stokescroftwriters.com) but decided to close it down in 2018. This is because all the events we run are free, so the group does not have any income. The website was costing us a lot of money every year and we weren't using it very much, so we decided to use a page on Chris's website instead. If you'd like to join our email list, please contact Chris. You can learn about the current members below. Here is the Talking Tales calendar, including a history of past events. Everyone is welcome, so if you fancy an evening of storytelling and drinking (the latter is optional) please come along. 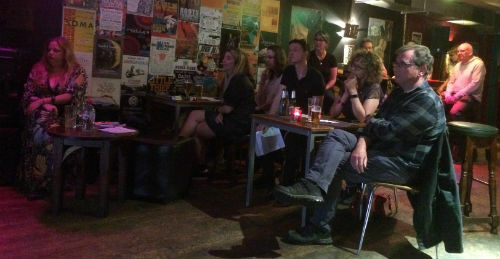 Entry is currently FREE to the vast majority of our events. 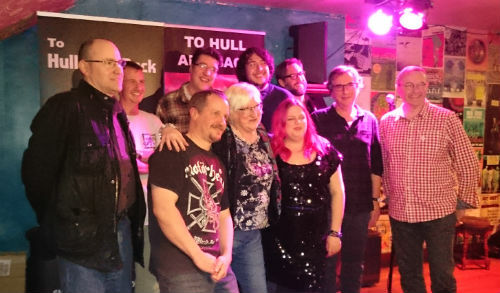 This picture was taken at the inaugural Talking Tales event on 13th April 2015. A few members have left, because we don't like them. JOKING. For various reasons, like moving away because of work, emigrating to Germany, not being able to stand Chris's unnatural hatred of incorrect use of punctuation 'for artistic reasons' etc. All of them are sadly missed, although we do still get to drink beer with some of them on occasion, which makes us very happy. Hi Chris et al. I tried to join up having got to that bit in your book (wot I am reading like a good 'un) and despite putting my details in twice and pressing the 'submit' button, nothing happened. So am not sure if I'm now subscribed, but I would like to get the newsletter and hope to come to the talking tales event in April. Hi Lindy. Great stuff, glad to hear you're reading the book like a good 'un. Sorry if you're having trouble with the form. Is that the one on the SCW website? Or my site? I've checked my email list, and you're subscribed to that. You aren't on the SCW email list, so I have added you to that one. I hope that's OK. Look forward to seeing you in April.